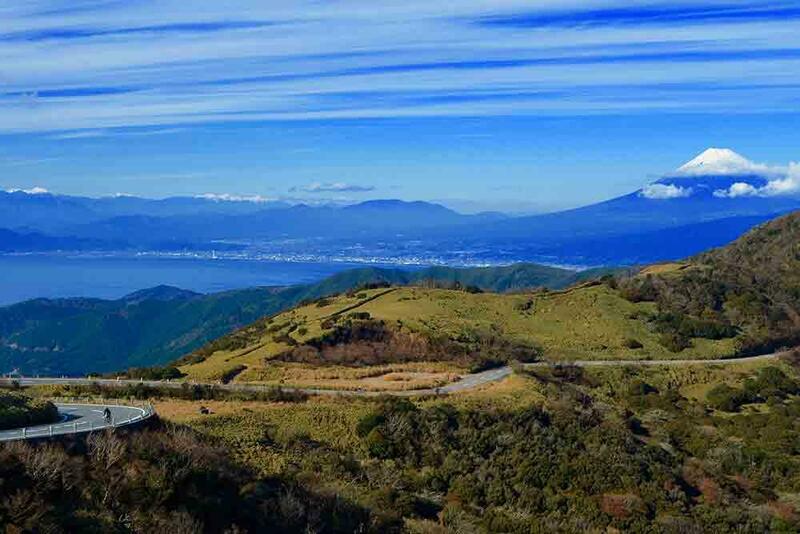 Nishi-Izu Skyline where you can enjoy magnificent viewing road of Mt. Fuji and Suruga Bay even in winter. 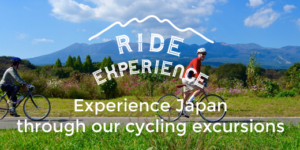 This is a “must ride” road when you visit Izu for cycling. Izu Peninsula is located on the eastern coast of Shizuoka prefecture and covers a stretch of 50km southward. There is a low mountain range that covers the great majority of the peninsula, with the highest peak on Mt. Mansaburodake at 1,406m in Amagi Mountains. There are few flatlands, so the routes here curve with climbs and drops (ups and downs, be hilly). The rides here offer beautiful views of both the mountains and the sea, as well as terraced rice fields which slope along the mountain. Mt. Fuji is also visible in the distance. The Izu Peninsula is on the Philippine Sea Plate and was originally a mass of submarine volcanic island under the southern seas. As it shifted northward, it crashed into mainland Japan and became the peninsula it is today. 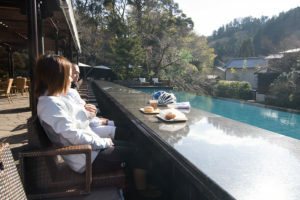 The volcano is still active and nourishes the area with rich onsens and a variety of geographical features. One rare case is the Kano River, a grade-one river running from the Amagi mountains, which flows northward into Suruga Bay. 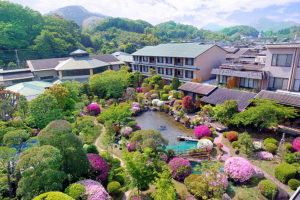 Izu has many famous Onsens and fishing ports, so a typical tour can enjoy fresh seafood paired with a hot spring bath. 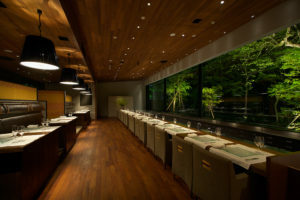 Additionally, there is wasabi which grows in the mountains and wild boar, a regional specialty. 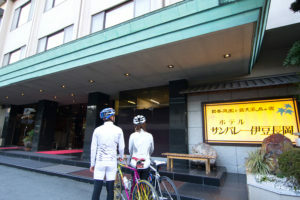 The climate is warm yearlong and many cyclists from the Kanto area come to ride through the mountains during the winter. 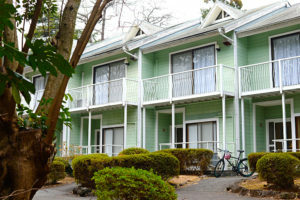 Travel to Izu is accessible from Tokyo by car or train, and there are ample accommodations. 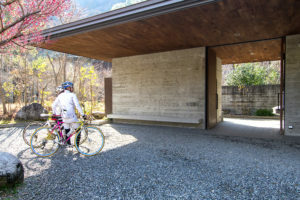 Izu marks a potential cycling spot for its comfortable lodging, delicious local foods, and hot springs. The old Amagi-san Tunnel is famous for the scenes in some fine pieces of Japanese literature. You can passed it through by bicycle but should be aware that the approach is unpaved road. A terraced paddy field made along the slope and a wasabi field that follows it. 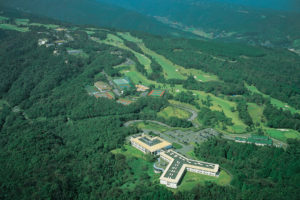 A landscape often seen in the Naka-Izu (the central area of Izu). Ridng from Toda to the west coastline of the peninsula in the evening, you may encounter such a wonderful scene that colored Mt. Fuji looks over Suruga Bay. 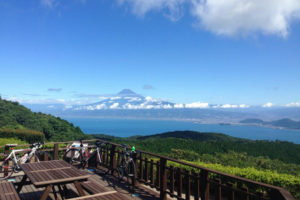 “Yamabushi Trail Tour” which conducts a guided tour as a MTB trail is a noteworthy new activity to enjoy Izu by bicycle. 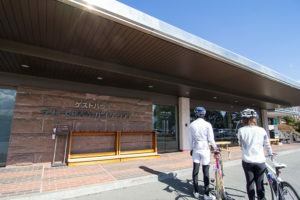 “Celeste Cafe” in Numazu City by the sea side owned by bicycle lovers couples. 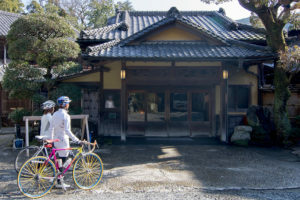 If you go to Amagi during cycling, why don’t you try the specialty “Yamaarashi Donburi” (a bowl of wild boar and rice) at the cyclist favorite dining hall called Suzukiya?